The intent of the Dead Letter Office page is to illustrate covers that show the fees that were required to return certain letters from the Dead Letter Office (DLO). The emphasis is on the fees that were charged to return or forward dead letters, not an amount that might have caused a letter to be short paid by the sender. 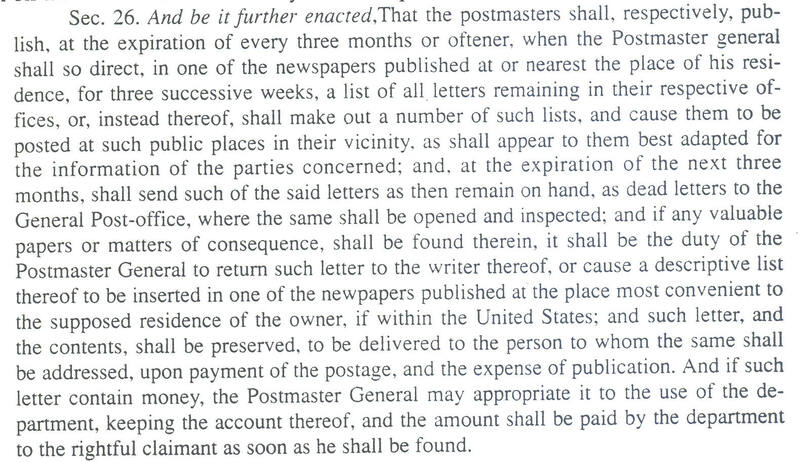 Handling undeliverable mail seems to have occurred from the beginnings of the General Post Office (Post Office Department) in the 1700s. David L. Straight states in his Stamp Collector article of July 14, 2003, that the position of Inspector of Dead Letters was created by Congress in 1777. Dead letters are letters that could not be delivered to the addressees and no return address is on the envelope. If unclaimed by the sender, they were sent to the DLO. 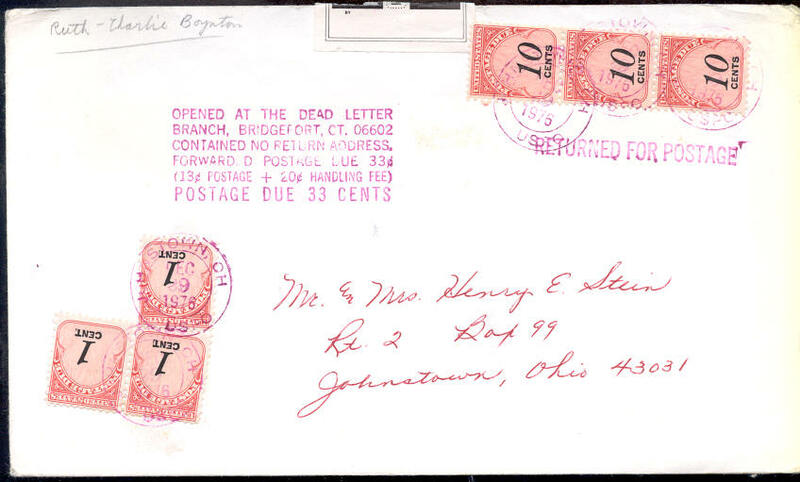 In the 1817 Postal Laws & Instructions, such unclaimed letters were called "Dead Letters." It was about 1861 when specially imprinted envelopes began to be used by the DLO. 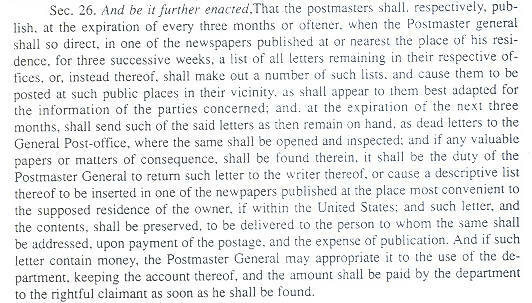 The fee, if any to be paid, was often printed on the envelope. 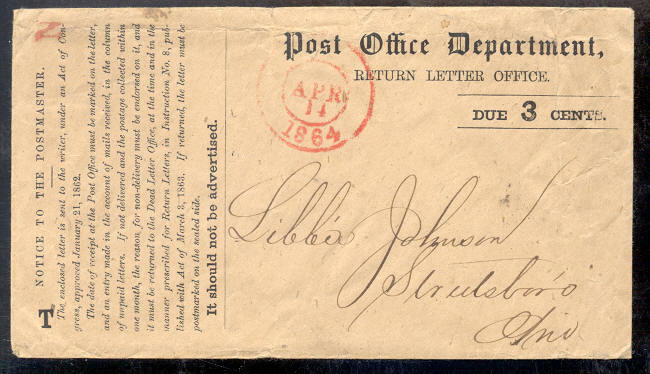 6¢ An act of Congress approved January 21, 1862, provided that ordinary letters that were returned receive a 6¢ charge. The 6¢ covered one rate for return (being sent to) the DLO and one rate for return to the writer or owner. 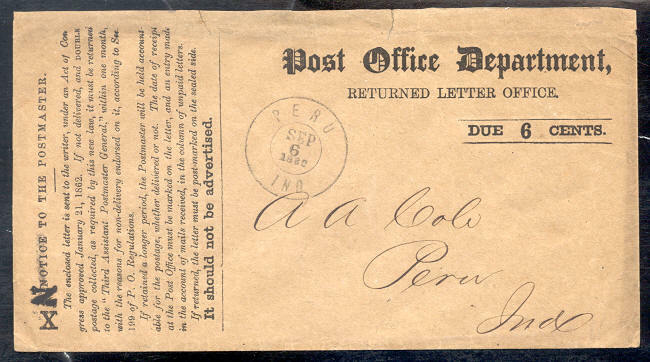 An additional 3¢ would be charged for valuable letters since these required being registered at the DLO. Valuable meant the envelope contained something other than written correspondence. 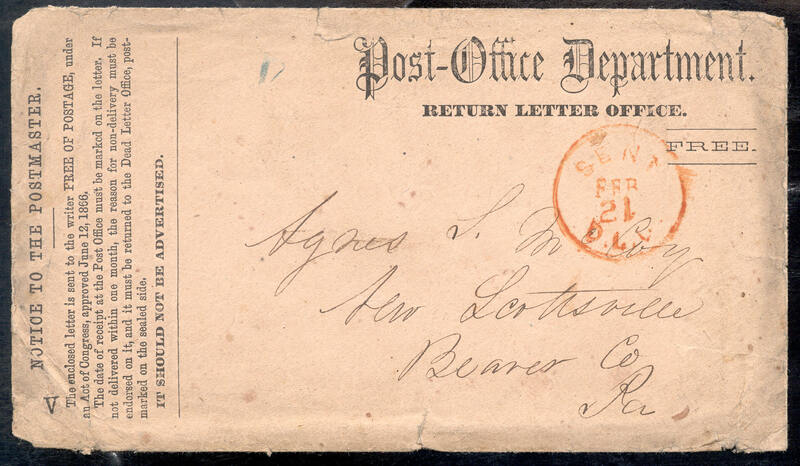 3¢ Effective July 1, 1863, the charge to return a dead letter was 3¢, due to a postal act passed on March 3, 1863. Free From June 12, 1866 to May 29, 1920, letters returned from the DLO were returned with no handling fee. 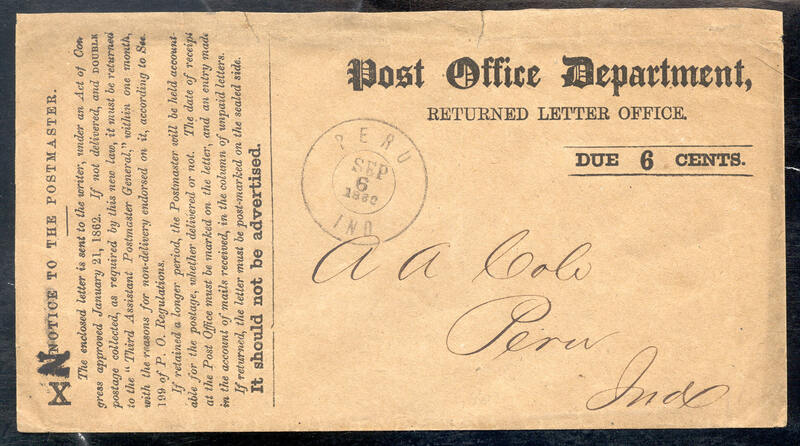 3¢ again A return fee was reinstated in 1920 in addition to any postage that was due on the original letter. Starting May 20, 1920, a three-cent return fee from the DLO was charged. This rate continued until June 30, 1935. 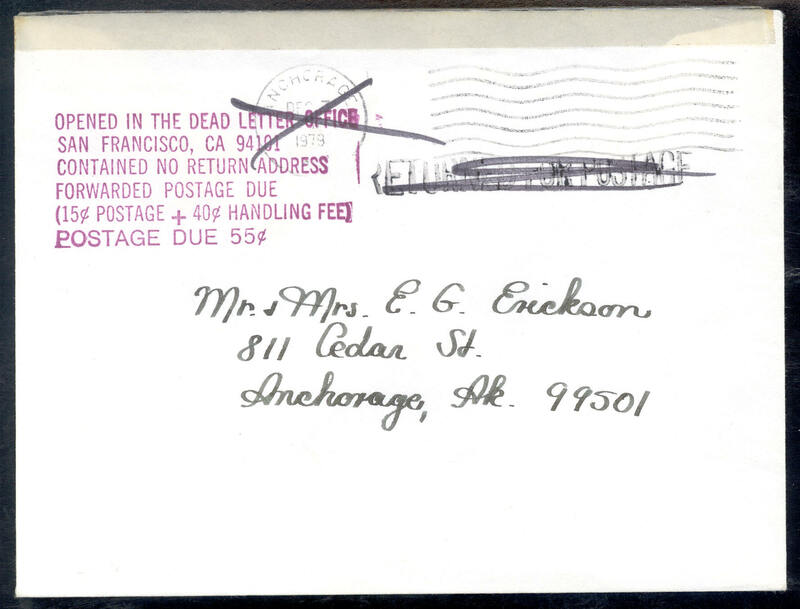 This fee, as stated on the cover, was to be collected because the sender's address was not on the envelope. The envelope was opened at the DLO to find a return address. 5¢ On July 1, 1935, the DLO return fee became 5¢. This rate continued for over thirty years until June 30, 1958. The message regarding the 5¢ fee states specifically that letters with the sender's name and address would not be sent to the DLO, but be returned to the sender. 10¢ On July 1, 1958, the return fee was raised to 10¢. This fee was in force until April 17, 1976. 13¢ From April 18, 1976 to July 17th of the same year, the DLO return fee was 13¢. Covers showing that fee during the short rate period are not easily found. 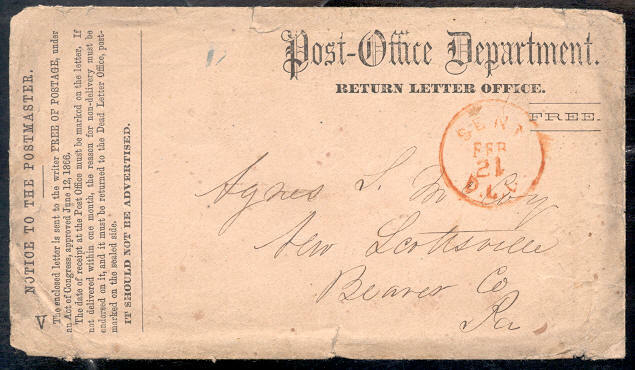 As indicated, the total due on this cover was 26¢, the 13¢ handling fee plus the 13¢ postage due originally. Perhaps an employee submitting expenses to the company sent it. The backdate of July 2, 1976 is from Phoenix, AZ. The cover was probably sent to the company to pay the fee and amount due. 20¢ The 20¢ handling rate was in effect from July 18, 1976 to May 28, 1978. This cover required payment of 33¢, 13¢ postage due and 20¢ handling fee for the DLO to open the envelope looking for a return address. 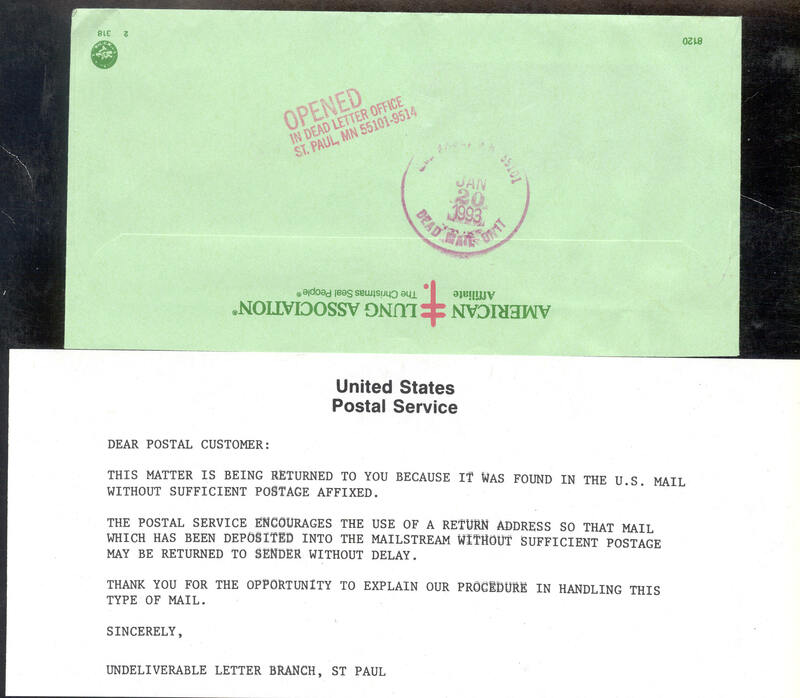 It has an "Officially Sealed" label indicating handling by the United States Postal Service (USPS). It was probably forwarded to Mr. and Mrs. Stein who would/may have paid the 33¢ to receive the cover. 40¢ From May 29, 1978 to March 21, 1981, the return handling fee from a DLO was 40¢. This is another example of a short paid letter that was sent to a DLO. 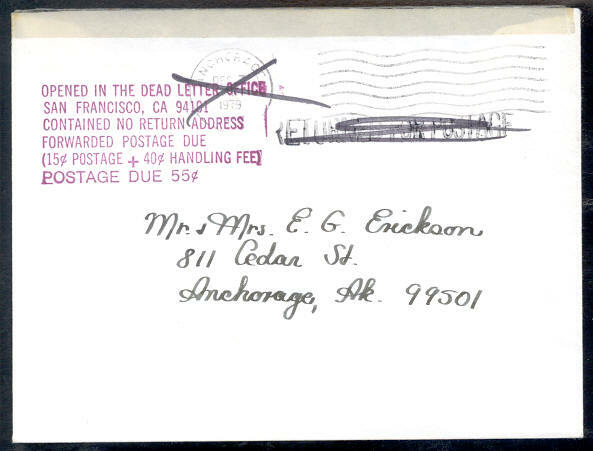 Tape at the top shows that the envelope was opened but no return address was found. 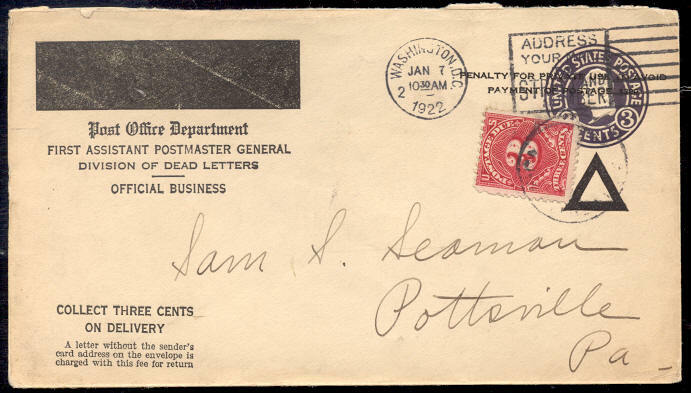 The cover would have been sent to the addressee for possible acceptance and payment of the 15¢ postage due plus the DLO handling fee of 40¢. 70¢ On March 22, 1981, the handling fee became 70¢. This fee lasted until February 16, 1985. 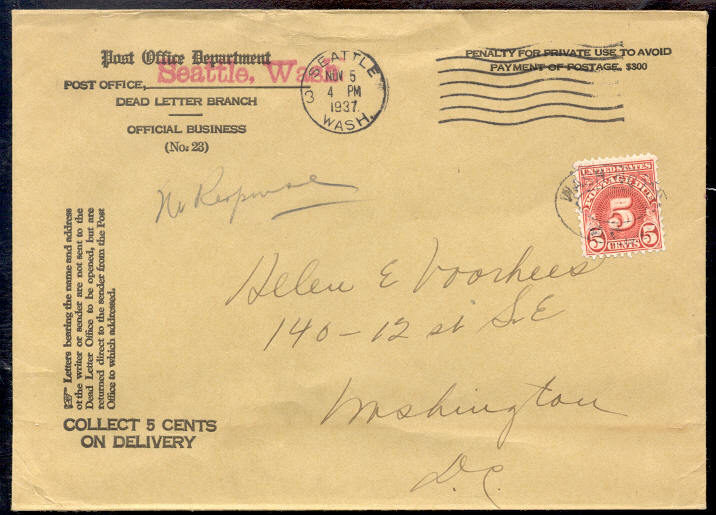 Here is another cover that was opened by the DLO and no return address was found. It was forwarded postage due (20¢ per ounce) with the DLO handling fee of 70¢ added for a total of 90¢ due. As of February 17, 1985, no handling fee was charged if a cover was opened due to improper addressing or no address showing. If after being opened, it was able to be forward to the addressee, that recipient would be charged only for any postage due. In this case 29¢ was charged for delivery of a piece of mail sent unfranked.